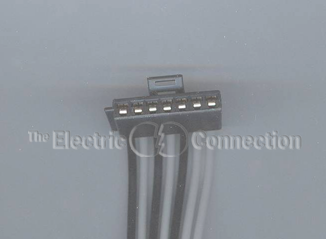 Our 4180 harness connector is made in the USA using Delphi components (current supplier to GM) and according to the latest GM design standards! It also comes complete with high quality seamless splicing connectors and dual wall heat shrink tubing with built in sealer. The most common cause of no blower operation is a failed terminal on the black wire, terminal "E" on the seven wire connector. If you lost most or all speeds at one time, this is likely to be your problem as well. It is easy to bypass, in order to have some blower operation, while you wait on your new parts to arrive from The Electric Connection. Locate the black wire at terminal "E" of the seven wire connector and cut it about two inches from the resistor. Locate the black wire that attaches to the blower motor and cut this wire about two inches from the resistor also. Now join the black wire you cut from the seven wire connector to the black wire that is still connected to the blower motor. Doing this simply restores the original ground for the blower motor, but it does it outside of the blower resistor assembly. The high or #5 speed should not work though because the resistor's internal high blower relay no longer has a ground supply. If the high blower happens to work it is only because the relay is stuck. If the relay is stuck, it may not turn off when the key is switched off, unless you tap on the relay or disconnect the wiring to the blower motor. Now just order your new parts from The Electric Connection and you will soon have your system fully working to the original design. From john of Sault Ste. Marie, Michigan on 11/22/2015 . From Cary of New Milford, Connecticut on 8/26/2012 . From Doug P of Monett, Missouri on 7/28/2011 . 11/28/2013 – 2005 chevy 2500hd silverado duramax. Blower (hot or cold) was intermittent and now VERY rarely goes on but doesn't speed . . . When I disconnect the fan, and check the . . .
7/6/2010 – I have a 2001 Chevy Silverado 1500 and the ac blower works sometimes and sometimes not. Would this be the Blower Motor Resistor? . . .
6/18/2010 – 2006 Envoy blower motor began working sporadicaly then totally quit. Assumed it was the blower motor resistor and found the . . .